Under the gunmetal skies of an overcast, early-season morning, two classic v-hulled walleye boats rock in the chop over a promising reef. For the past three hours the anglers have done their best to trigger bites from the bottom-hugging ’eyes clustered below. But while their tactics are similar, their success rates and spirits couldn’t be more different. One boat holds happy anglers. Steady action and a full livewell have them eagerly awaiting this evening’s fish fry. The other anglers are considering mutiny after a frustrating morning and zero fish. Lucky for the helmsman there’s no plank to walk. Non-fishermen find it hard to believe that two fishing parties can sit over the same structure at the same time and have such opposite luck, but veteran Northwoods guide Bill Rosner understands. Decades of logging more than 100 trips a season on walleye-rich waters like northeastern Minnesota’s massive Lake Vermilion have taught him that paying attention to the finer points of location and presentation can mean the difference between enjoying banner days and suffering a skunk. Often that means focusing your efforts on a productive combination of water depth and some form of structural, fish-holding subtlety such as a transition in bottom composition or a small, flat shelf adorning an otherwise sharp drop-off. On Vermilion, a 40,000-acre, tannic-stained walleye factory featuring classic rock, mud and sandy substrate, Rosner’s early season search zone starts with 16- to 22-foot-deep sand flats adjacent to the walleye’s shallow, hard-bottom spawning grounds. These sand flats serve as transition areas between spawning grounds and the deep-water rocky structure walleyes use as summer homes. Surprisingly, another of Rosner’s most-productive early patterns is a deeper bite. He fishes 25- to 35-feet of water along steep breaklines just off spawning areas, normally associated with a mainlake island. Rosner’s go-to tactic for taking early ’eyes is Lindy Rigging live minnows. Jigs and minnows are another option, but he’s settled on rigging as a more consistent tactic. The setup is simple, yet deadly. 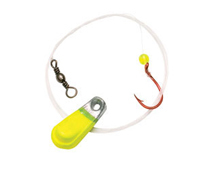 The rig comes with a pre-tied 42-inch snell, which Rosner says is ideal for early season. A painted walking sinker is standard, and while the venerable design is a fine option in its own right, Rosner often upgrades to a 3/8-ounce Lindy No-Snagg Slip Sinker because the banana-shaped weight slides over rocky structure and wood cover without snagging. Many early season walleye riggers use a snell float to keep the bait off the bottom, Rosner prefers to keep his floats in the tackle box until a bit later in the season. He begins using a float when the water warms and hungry crawfish come out of the mud to harass the rig. During the early season, he prefers the No. 2 hook rather than the No. 4 for minnow fishing. Later in the year he’ll use the smaller No. 4 hook with nightcrawlers or leeches. 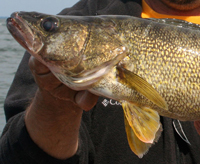 He prefers 3- to 4-inch chubs for early walleyes, and hooks them for maximum action and snagfree use. Slow and steady is the rule for rigging speed. Rosner recommends a rather pedestrian pace of less than 1 mph, with .6 to .8 mph falling in his favorite range. He prefers to forward troll with the bow-mount trolling motor, using sonar and GPS to follow key contours on breaklines, and to repeat successful trolling passes across the flats. It’s worth noting that when Rosner targets the deep, steep break pattern, he may switch to jigging tactics. “Not many people are into it,” he grins. 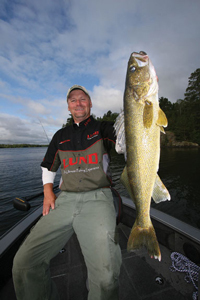 “But a 3- or 4-inch chub on a black or chartreuse Lindy Jig can put up big numbers of walleyes. Most of the fish on deep drop-offs are spawned-out males under 17 inches long, but what’s better for an evening fish fry?” - Not much, indeed. Slow and steady is the rule for rigging speed. Rosner recommends a rather pedestrian pace of less than 1 mph, with .6 to .8 mph falling in his favorite range.